After three days of cancelled flight, I finally arrived in Legazpi city. At the moment, there’s no flight directly from Manila to Sorsogon city where Irosin, my hometown belongs so I always need to drop by here. If you want to know how long it takes to reach Irosin from Legazpi, it is about 4 hours by bus or 3 hours by van. I lived in Legazpi city for 5 years – 3 years in college + 2 years from my previous work. During this time, I didn’t know about travelling so this poor girl has never been to the Lignon Hill or never tried ATV riding near the borders of Mount Mayon. I never cared to know the history of this city. The reason why I decided to drop by in Legazpi for a night is to wander around and perhaps see a friend for coffee. I want to do a detailed travel guide to Legazpi plus its nearby towns that has the potential to attract tourists like Donsol for whalesharks. For my accommodation, I chose Mayon Backpackers Hostel which I learned from a post of a fellow travel blogger Facebook friend. I have been travelling around the country and SE Asia for a few years now but honestly the idea of spending a night in a backpacker hostel just sank in after my trip in Cambodia. I featured Mad Monkey Hostel – a great place for adventurous backpackers. If you are a young traveller, you don’t stay in a boring hotel. You stay in a backpacker hostel, not only because it is cheaper but this is a great place to anyone who is up to meeting more like – minded travel and party addict. Most of all, this is highly recommended for those who are single and ready to mingle backpackers. The province of Bicol unlike Ilocos, Palawan, Cebu are not yet within the backpacker radar so I am actually not expecting young travellers from around the world in Legazpi City. However when I checked in, I was surprised to see a number of European, Australian and American backpackers. As a matter of fact, I was the only local there who are booked that time. When the night came, a young Filipino engineer checked in, he was no backpacker but a regular clientele who hails from Manila. He said he lives in a remote place near the river because he is supervising a road repair. When it rains so hard, the flood gets in his rented house so he comes to this hostel to stay until the weather is fine. He chose Mayon Backpackers Hostel because this is the cheapest and most convenient. Mayon Backpackers Hostel looks like a typical cemented up and down house that gives you a homey atmosphere. The reception desk is located before the main entrance door. When you step inside, at the right side is a wooden sala and in front are dozens of photos from previous guests then to the left is a desktop where you can browse the Internet for free. Just a few steps more is a long wooden table where you can share with others while you eat and a refrigerator where you can put your stuff. What made me really surprised is a gas stove that any guest can use to cook. This is a great way to save from incurring additional costs of too much eating outside and the best way to eat your preferred food. What really blew me away is that I never expected that all of their shared dorms are mixed – meaning boys and girls in one room. I have nothing against with it, I have done it during my Singapore stay just that it may not be fully emphasized or I did not noticed at all in the Mayon Backpackers Hostel in Legazpi city. Of course I would prefer to share with fellow ladies if I have a choice. Good thing that time, the hostel is not fully booked so it was me and the young engineer who shared the room. He slept very early while me I took advantage of the strong wifi connection to do my online stuff so I was up until close to midnight. I had to stay in the sala the whole time because the wifi is very weak inside the room. I’d like to add a thousand plus points for Mayon Backpacker Hostel for a very consistent Internet connection. I really appreciate this strong reliable wifi since yours truly works online. I did not have to find a coffee shop or go to the nearest Internet shop. In other words, I saved a more or less a hundred pesos for that. While my eyes are fixed in my laptop in the living room, those foreign backpackers are busy cooking their stuff. I heard from one of them that he is sick of the usual rice and pork meal here in the country so he went to the nearest market then bought veggies and fruits to cook it the way he want it. I woke up around seven in the morning, went out then took my free breakfast. On the table is a big plate of fresh from oven small pandesals, two sachets of tuna and mayonnaise spread, three – in – one coffee packs and banana. The young engineer just woke up and I took the liberty to start the conversation that is why I learned of his story. I went up to the second floor to see around. Since there’s currently typhoon – it is raining so hard and I cannot see the majestic and near perfect cone shaped Mayon volcano. At the rooftop, there’s a small bar where I think a group of backpackers can sing videoke and hangout during the night. I don’t think this one is used often because Mayon Backpackers Hostel is not a typical big hostel for party addict backpackers just like Mad Monkey Hostel in Cambodia. Also one more thing, I wish that they will have their own set of staff who can cook meals for their guests right at the premises of the hostel. At the moment, they have no means for that which I see why they have a free cooking stove to be used to those who want to cook. Either way, it is a great idea. Mayon Backpackers Hostel’s dorm bed costs Php250 with electric fan and Php350 with aircon room. If you want a room for two person it is Php1000. There’s nothing much outstanding about Mayon Backpackers Hostel but the warmth of staying in an abode specifically made with young fellow backpackers who doesn’t mind sharing rooms in the spirit of fun and adventure is a great reason why you should stay here for a night before your backpacking trip to Sorsogon, Masbate or Leyte. While I was taking my breakfast I was able to finally chitchat with a few foreign backpackers – one of them is from US. He’s been backpacking around the world and does not even care to take photos anymore. He said he has gone tired. I also met a Singaporean guy who just checked in, we shared lunch after and left the hostel awed by his round the world trip. The rooms has basic necessities - one pillow, a bed sheet, big cabinet that functions as a partitioned locker and individual power source attached near each bed to charge your own gadgets without going further. The comfort room is ok – I wish they can make it cleanest as possible. I never tried the shower so I don’t know if it was working. 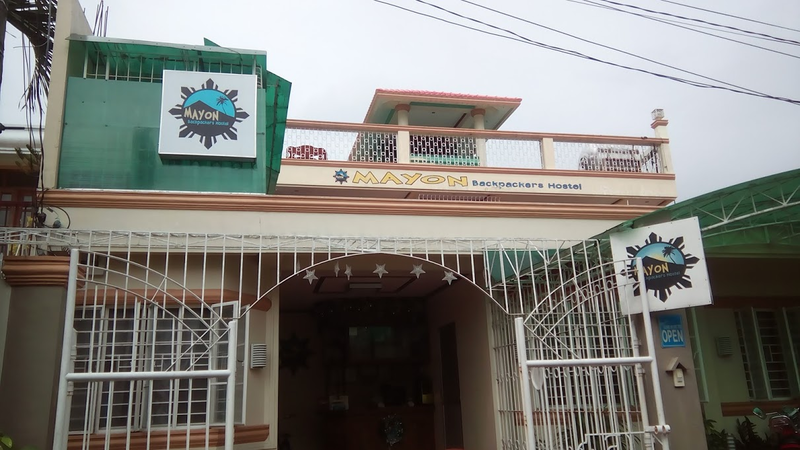 Currently Mayon Backpackers Hostel can house twenty plus backpackers. Glen who is one of the staff has been so nice to me. When he saw me sitting on the floor while my laptop is on the wooden couch, he quickly offered a never been used floormat where I can sit comfortably. He told me that there is an undergoing construction of the extension of Mayon Backpackers Hostel just two houses to the left. This one is good for seventy plus backpackers. I hope by this time, they should consider to have an all – female dorm and all – male dorm to those who prefer to stay in the company of their same gender. I am personally recommending Mayon Backpackers Hostel, because I know that doing so means also promoting the tourism of my own province to fellow local backpackers and around the world. Sadly, I never got to explore the tourists spots to see in Legazpi because of the rain so I just went home but still thankful I met a few backpackers and delighted to see how they travel the world through their own eyes and their words. I made sure I took home travel pamphlets courtesy of the local tourism office of Legazpi from Legazpi airport so I can write itinerary guides to backpacking in Bicol soon. It is so hard for me to have a decent connection here in my hometown so I will post the rest of photos when everything is up. I have not seen any recent mayon backpackers hostel blog review for this year that is why I decided to feature them because they are one of the best examples of a cheap accommodation in legazpi city. And please do take note that Mayon Backpackers Hostel is different from Magayon Hotel. You might be confused. Mayon Backpackers Hostel is just behind the Daraga Church and Divine College World of Legazpi. You'd need to walk or take a tricycle for 5 minutes to get in. very informative. i'm planning my vacation in bicol region soon.